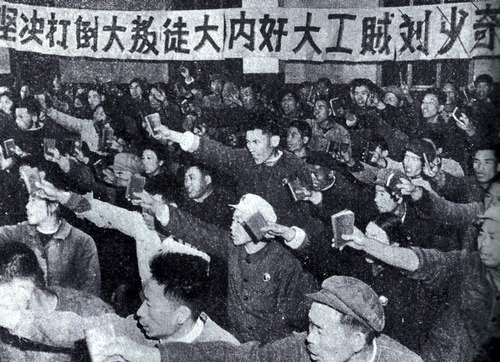 The “Cultural Revolution” led to a violent civil conflict for control of the Chinese Communist Party that plunged the country into chaos for a decade. New York Times reporter David Sanger’s Confront and Conceal: Obama’s Secret Wars and Surprising Use of American Power, better known for being at the root of an election-year political controversy over national security leaks, paints a disquieting picture of the Obama administration’s perceptions of contemporary China. The incident and the conflicting interpretations of it given by Obama’s advisers indicate an extraordinary low level of trust in the Chinese leadership and knowledge of its decision-making processes. High-level guessing games about imagined symbolism and secret messages are reminiscent of the old stereotypes of Soviet behavior during the Cold War. Obama’s aides complain about the difficulties of dealing with mercurial (or should I say “inscrutable”) rulers with an uncertain grip on power, a scheming “red” military with its own agenda, and xenophobic elites possessed by an aggrieved sense of national history. A former colleague of Gates told Sanger the former defense secretary “talked about China as a modern day Soviet Union.” If Sanger’s account of Obama administration perceptions of China is accurate, virtually the entire administration seems to see China that way. ”Stealth containment” is an oxymoron. The target needs to know you’re doing it in order for it to work. The term Sanger may be looking for is “polite containment.” The Obama administration’s policy is to speak softly to the Chinese leadership in the politically correct “stakeholder” discourse of “globalization” while trying to wield a big stick of regional alliances held together by American military power and the fear of China. Thinking about contemporary China as a “modern day Soviet Union” to be managed through a policy of containment is unlikely to produce effective results. China may have a political system composed of institutions, like the Politburo, that create an impression of similarity with the Soviet Union, but China has a dramatically different political history that is more significant. Informed discussions of that history are conspicuously absent from the ruminations on China imparted by the Obama administration China experts who shared their confidences with Mr. Sanger. The view of modern Chinese political history reflected in the book is striking. It mistakenly describes the Chinese Cultural Revolution (1966-1976) as if it were a centrally controlled event firmly under the direction of a single personality: the “Great Helmsman” Mao Zedong. Every serious historical account of the era, both in China and the West, depicts a country in chaos, torn apart by hysterical warring factions of radicalized twenty-somethings no longer under the control of their patrons in the Party hierarchy, roaming the country committing random acts of ideologically inspired violence. Sanger’s book suggests, however, that Obama’s advisors believe today’s China is somehow less organized and controlled than it was during the Maoist era. The Chinese leadership’s fear of another “Cultural Revolution” informs its reluctance to engage in much-needed political reform. When it started, the “Cultural Revolution” was supposedly an experiment in democracy aimed at smashing the intrenched power of the Chinese Communist Party bureaucracy. Memories of the chaos and terror it unleashed led Chinese “senior leader” Deng Xiaoping — who the book nostalgically depicts as a visionary — to force Chinese soldiers to use lethal force to suppress the student demonstrations that ended in the Tiananmen Massacre of June 1989. The President is a well-read individual who seems to appreciate the utility of studying political history. It is odd, therefore, that he is leaving key decisions about the U.S. relationship with China to senior aides who speak about the country in Cold War cliché and appear to lack a nuanced familiarity with China’s past. The generation of twenty-somethings that came of age during the chaos of the Cultural Revolution is about to take the reins of the government from the last appointed representative of the founding fathers of the People’s Republic. The current President and Party General Secretary, Hu Jintao, was hand-picked for the posts by Deng Xiaoping before the “senior leader” died in 1997. Xi Jinping, Hu’s heir apparent, was elected to his current posts by his peers in the Party Central Committee, as a dark horse if the rumors are true. Knowledge of the events that shaped the lives and beliefs of the incoming generation of Chinese leaders is more likely to produce an effective approach to U.S. China policy than imagining their country as “a modern day Soviet Union.” It is difficult to predict or influence the behavior of people you don’t understand. The Chinese Communist Party does not volunteer a lot of information about itself to outsiders — even to the people it governs — but that is no excuse for the administration’s apparent lack of awareness of China’s recent past.